Identification of vacant and underutilized properties, knowledge resources, and key economic assets. 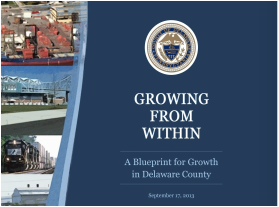 The Plan, finalized in June 2013, is being used to promote job growth, opportunity, and community vitality, and will serve as the road map to the future for the County’s economic success. ﻿﻿To support the overall improvement plan for the Keystone Corridor rail line, Delta completed two feasibility and assessment studies for PennDOT. The first feasibility study identified potential sites for the relocation of the Middletown Amtrak Station, which included an analysis of parking required to accommodate growth and a b﻿enefit-cost analysis. In addition, Delta developed a comprehensive assessment of the Keystone Corridor as part of a separate engagement in 2013. The strategic plan reviewed 12 Amtrak Stations along the route between Harrisburg and Philadelphia, Pennsylvania. The plan included an assessment of the station characteristics and market areas in order to determine the suitability for transit-oriented development (TOD) at each station. The recommendations from the assessment are guiding PennDOT’s policy for public investment along the Keystone Corridor. Located in the southern part of Gettysburg, Pennsylvania, Steinwehr Avenue hosts approximately 53 tourism-related small businesses. After the Gettysburg National Military Park Visitors Center was relocated about a mile outside of the town, Steinwehr Avenue experienced a drastic decrease in the number of tourists walking through the area, resulting in a loss of business and the closure of shops. Delta, in collaboration with Main Street Gettysburg and the Borough of Gettysburg, prepared a revitalization master plan for the Borough’s downtown business district. The master plan included a review of existing studies, market analyses, comparable communities analyses, stakeholder interviews, business surveys, visitor surveys, and monthly meetings with the steering committee in order to identify the key challenges and to outline a revitalization strategy. The Revitalization Plan has been used to leverage federal and state funding requests of over $5.8 million to strengthen the economic viability of the downtown business district. 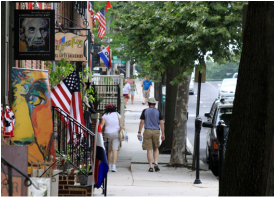 Cheltenham Township, located east of the City of Philadelphia, hired Delta to develop new strategies to revitalize stagnating commercial districts. Delta began the work by conducting a field reconnaissance of each commercial district in order to understand the current business mix, traffic flow, and retail environment. Delta then conducted consumer and business owner surveys to determine what issues and problems were currently deterring business operations. With the data collected, Delta developed a business retention and recruitment plan for each of the five commercial districts. Each plan repositioned the corresponding district in the marketplace in order to capitalize on spending potential in the defined market area. 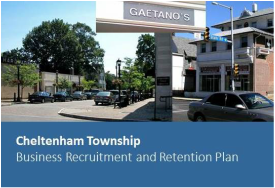 Delta also created a business recruitment brochure and property profile template for Cheltenham Township to promote properties available for lease or sale. 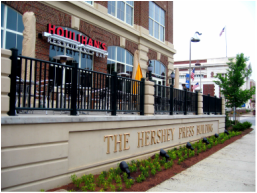 Delta was contracted in 2007 to assist with the creation of a redevelopment master plan for downtown Hershey that would capture the local history and heritage, reflect the local character, and diversify and strengthen the local economy. Delta’s role in this engagement included overall project management, market assessment, public input facilitation, identifying and securing public funding for site development, and government relations. To implement the Strategic Revitalization Plan, Delta worked with local, state, and federal stakeholders to successfully secure $4.5 million for relocating State Route 743, replacing a bridge, enhancing streetscapes, and installing a pedestrian underpass to facilitate mobility in the downtown district of Hersey. Delta was hired by Cranberry Township to update the Township’s comprehensive plan, with a focus on developing a unique and sustainable approach to its land use planning. Delta compiled baseline data that included an assessment of current land use, future developable spaces, and the current tax structure. 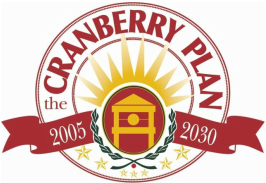 Concurrently, public meetings were held to determine Cranberry’s Vision for 2030. The updated plan includes changes to the zoning ordinances that promote dense development, open space preservation, and business development using Traditional Neighborhood Design to establish more mixed-use areas. The finished comprehensive plan was selected as the winner of the 2009 Daniel Burnham Award for a Comprehensive Plan, which is the most prestigious award of the American Planning Association’s Pennsylvania Chapter.